Hospital cash back or medical aid? A Fin24 user wants a comparison between hospital cash back policies and medical aid schemes. Damian McHugh, head of marketing and sales at Momentum Health responds. The answer to this question will really depend on what a health care consumer’s needs are. It is always recommended that a financial advisor be consulted to find the best fit for the particular family. 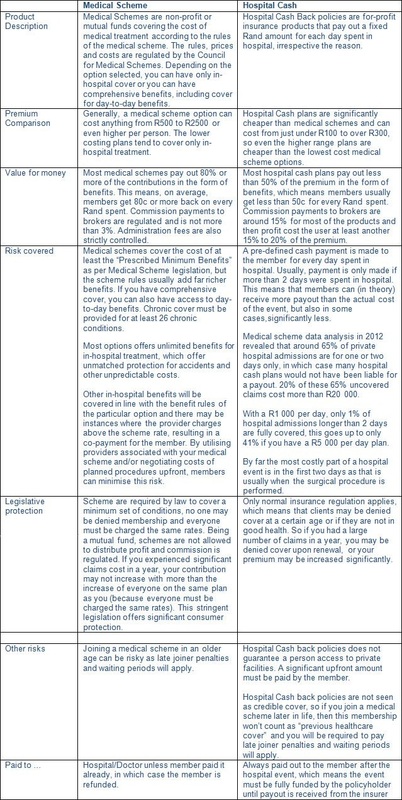 In terms of comparing medical schemes with hosptial cash back policies, comparisons can be drawn on the basis of the type of product, its price, value for money and risk covered. It is important to note that these comparisons (provided below) are generalised and may not be applicable to each and every case scenario.